Image Size: 29 X 20 in. Image Size: 44 X 30 in. 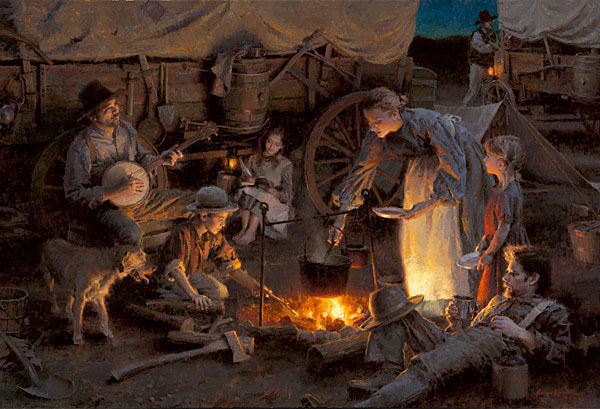 “I have been fascinated with stories about the Oregon Trail and Santa Fe Trail since I was a child,” says Morgan Weistling. “My grandmother used to tell me how my ancestors had travelled by covered wagon to their new home in the West. She would show me little mementos that had been handed down from that time. When I decided to finally depict a scene from this historic event, I dived into piles of research that are available. Many of the women along the trail kept diaries that give us daily accounts of their journey. I chose to capture what they called the 'favorite time of the day.’ After walking for eight hours, toiling with oxen and any number of problems, they would set up for the night and rest. A campfire and some music went a long way toward spreading some peace at the end of a very hard day.